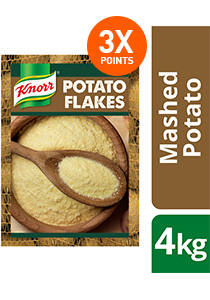 Made with 99% potatoes - sustainably sourced, the premium flake format of Knorr Potato Flakes delivers greater versatility. Scratch-made taste and texture in every dish you use them. KNORR Potato Flakes offer a versatile, high quality potato base for chefs to work from. Made with sustainably sourced potatoes; harvested, flaked and dried to create a professional ingredient. They allow you to express your creativity and create a variety of different dishes with ease… from rich & creamy mashed potato with a scratch-made taste & texture; to croquettes with creamy filling & crispy, golden crumb; or a variety of other dishes. 1. Bring water and salt to the boil. 2. Turn off heat and add cold milk. 3. Whisk in Knorr Potato Flakes, until well mixed. 4. Allow to stand for 2 - 3 minutes and whisk once more before serving or keep warm in a bain marie. PREVENT CROSS-CONTAMINATION WITH GLUTEN DURING PREPARATION TO ENSURE GLUTEN-FREE MEAL. 4KG makes 30KG of prepared mashed potato. To keep fresh, seal foil bag tightly.